Friday, Nov. 23, 2018, the MEK/PMOI supporters rallied in front of the Municipality building in Copenhagen against executions in Iran and demanded adequate measures against this state-sponsor of terrorism. MEK/PMOI supporters called for the European Union to blacklist the Iranian regime’s Ministry of Intelligence & Security (MOIS), shutting down all the mullahs’ embassies in Europe. They also demanded the expulsion of all the regime’s operatives from the EU soil. Iranians abroad consider these embassies as the regime’s espionage centers used to gather information for their future terror operations. 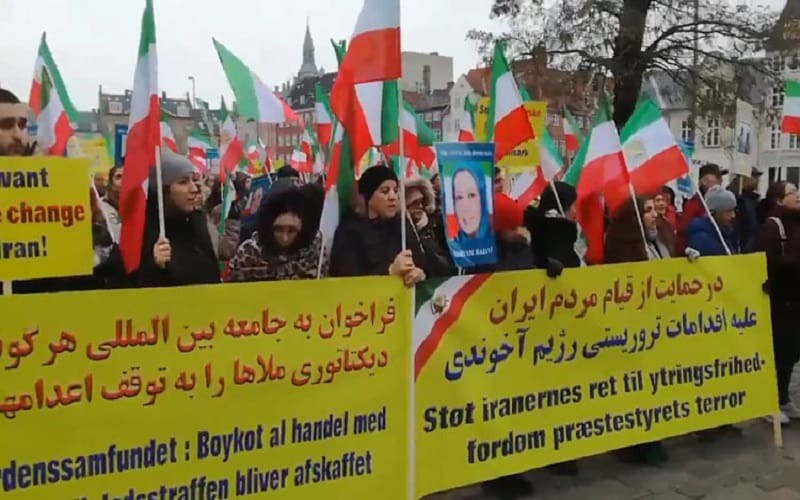 In their rally in Copenhagen, the MEK/PMOI supporters also announced their solidarity with the ongoing protests by people from all walks of life inside Iran. They also called on the international community to support the Iranian people’s desire for democratic change. Since three weeks ago, Shush, a city in Iran’s Khuzestan province, is witnessing strikes and protests by the workers of Haft Tapeh sugarcane factory. The workers began their strike three weeks ago, demanding their salaries, unpaid for months, and the removal of the so-called private owners who have looted factory’s properties and pushed Haft Tapeh, the largest sugar mill in Iran, towards bankruptcy. In addition to Haft Tapeh, the workers of Iran National Steel Industrial Group in Ahvaz gathered for the 19th day of their strike and protest, demanding their unpaid salaries. Having no access to water, the farmers in Esfahan have risen, protesting against the mismanagement of water sources by the government. The protesting farmers of East Isfahan had white vests on, symbolizing the grave shrouds, a sign that they will be standing for their rights at any cost. On Sunday, Nov. 25, 2018, the farmers of Gharneh, East Isfahan, gathered in front of the Yazd water pumping station in protest to the government’s mismanagement of water sources. During the past years, the Iranian regime’s corrupt policies have cut off adequate access to irrigation water for this farmers, causing much damage to them. The protesters threatened to destroy the station if the government does not take concrete measures to fulfill their demands. The farmers had brought along their loaders and other machineries. At noon of the same day, still having received no response, the farmers proceeded with destroying the pipeline that channels the station’s water to IRGC companies in Yazd. These days protest over economic grievances quickly turn into anti-government protests that call for the overthrow of the regime in its entirety. After 4 decades of witnessing and experiencing the corruption and the repression of the regime, the Iranian people have no doubt that there is no solution from within the regime and only a regime change will solve their problems. As a human rights activist in Iran, I expect the international community to condemn the crimes of the Iranian regime by its terrorist acts. The Iranian regime uses maximum violence in the region. The Iranian regime is leading the sectarian war at the highest level.